Cannon from the Kadyak on the seafloor near Kodiak Island. Source: Archaeology Magazine. Off Alaska’s Kodiak Island lie the remains of the Russian-American Company ship Kad’yak, which sank in 1860. The wreck of this Barque was rediscovered in 2003, as this first-hand account documents. (It is full of the usual intrigue between divers and dirters and is rich with interesting links about the discovery). 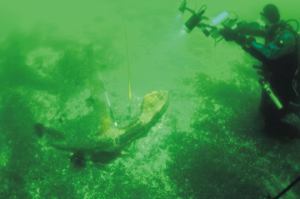 Almost immediately, an underwater archaeological research project was formed, participants included people from the Kodiak Maritime Museum, the Baranov Museum, the Alutiiq Museum, the State of Alaska Department of Natural Resources, NOAA National Marine Fisheries Service in Kodiak, and East Carolina University. This was the first underwater archaeology project in Alaska, and it is ably documented by the Alaska Office of History and Archaeology. The oldest shipwreck discovered in the state, the Kad’yak holds a special place in native lore about Father Herman, a Russian-Orthodox missionary, who established an orphanage and chapel on Spruce Island. After his death in 1836, the church canonized this beloved priest. In 1860, the Kad’yak’s captain promised to pay homage to St. Herman at the Spruce Island chapel before setting sail for San Francisco, California, with a cargo of 350 tons of ice. He failed to keep that promise. Shortly after sailing off, the ship struck a rock, briefly drifted, and sank before St. Herman’s shore-side chapel. When the ship sank, the mast and yard arm remained above the water, forming a cross that the native people believed to be a sign of divine retribution. The OHA site is an interesting series of pages, including a small photo gallery, of the project, which must have been a challenging logistical exercise, considering the location and nature of the water. Fittingly, as this is the only Russian America Company ship known, you can translate the site into Russian, page by page at least. There is an overview of Alaska underwater archaeology here and a database of Alaska shipwrecks here. NOAA and Archaeology Mag also have short articles on the Kad’yak, some of them with better pictures. No lives were lost on the Kad’yak, which was laden with a cargo of 350 tons of ice bound for San Francisco. None of the cargo has yet been recovered. Divers explore the anchor of the Kad'yak. Source: AK OHA. The OHA site also led me to another shipwreck I had never heard of before, though with less justification: the loss of the coastal passenger steamer Princess Sophia on October 26th, 1918, near Juneau. Horrifyingly, the wreck hung on to the reef 36 hours in a howling wind with rescue vessels in attendance, before going down with all hands lost: some 343 souls, the worst maritime disaster in the History of Alaska and British Columbia. One dog survived. The events are recounted in an unusually well-written and illustrated wikipedia article, and in this lively blog post. Considering that the Titanic loss was about 1500 souls relative to all of Europe and North America, to think that in a remote corner of the world a regional passenger boat sank with the loss of 343 is a remarkably serious tragedy. I suspect the proximity of the loss so close to the end of World War I has dimmed the memories from the beginning. This entry was posted in alaska, Archaeology, history, Northwest Coast, underwater archaeology and tagged alaska, Kad'yak, kodiak island, Princess Sophia, SCUBA, shipwrecks, underwater archaeology. Bookmark the permalink. James Mitchener’s “Alaska” had an aweful chapter on the Princess Sophia. The crew and passengers could have been saved, but the insurance company or owners refused because it would give salvage rights to whoever helped. I think the US maritime laws were changed as a result. The cannon looks like the “Nitinat carronade” I recorded as a site (a heritage object would have been better). It armed Tsuquadah, the village a few km north of Nitinat Narrows, when that village provided many of the warriors for the defense of the area. Later, it was moved to Whyac by canoe; a matching cannon was apparently lost on the bar coming in to the Narrows. It was functional for a while then was only fired for fun once in a while. It was moved to a small shelter outside the school at Balachadt (Ditidaht village). I looked for it a while ago and it wasn’t there, I wonder where its latest place is? It was very rusty and I believe I figured out it was a four-pounder or six-pounder; a pretty light cannon, but still enough to deter all but large warships.